My preference is this: no speed limits on (true) roads, engineered to be safe at any speed; and very low limits (30kmh or below), and engineering that enforces this, on (true) streets. First ensure every thoroughfare is unambiguously a road – rural, no buildings, no intersections, no parking – or a street – sidewalks, bikelanes, transit, buildings, parking etc. Low limits on wide streets is tantamount to entrapment. Wide streets, of course, ought to be completed or otherwise narrowed. There is no road “engineered to be safe at any speed”. It is not possible. Every road has a “design speed” – just as every bridge has a load limit – and there is some margin for error. But “safe” is not an absolute, and also the acceptable level of safety achieved relies on a wide number of variables, and the road design is only one of many elements. Your preference would require nearly every street and road to be rebuilt, and is quite unrealistic. Fortunately, what is currently proposed does not affect streets at all, and will only impact provincial highways in rural areas. Thanks for covering this Stephen. My response to the call for Tweets was this: What problem are we trying to solve here? Are we not burning enough gas? Are roads too safe? It used to be a time when Canada was a leader in road safety,with almost twice less fatality per inhabitant that in Europe, that was not that long time ago…but things has changed a lot in the last 15 years in Europe. What Europe did in the last 15 years? -When a road is invitating to speed higher than posted limit, posted speed limit : road is redesigned (round about everywhere !) to prevent high speed. The US introduced energy saving speed limits when my Kingston based job at Alcan included visiting a production plant in Oswego, NY . None of us that drove down found the speed restriction onerous. We had just been through the massive oil shock of 1973 when oil delivery delays had impacted Alcan production. We thought the speed limits logical. The US government move did not stop us thinking of other ways to reduce energy use and we could not help noticing there were many empty beverage cans on the highway.. . . ..
One outcome of the period is a way to recycle used beverage containers.. In 1981 the method went into production in Oswego. By 1989 Alcan made twice as much fresh metal from used beverage cans as was made in Kitimat. And the new metal arrived “pre-delivered” to Europe and the US. The step became the economic driver of municipal waste recycling. 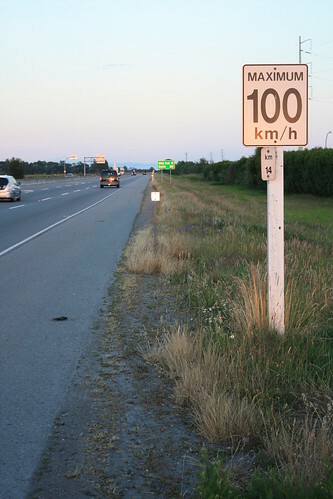 Lowered speed limits would trigger thoughts in BC. Some thoughts may be unhelpful —-but some could increase productivity and reduce carbon use as happened despite the slow road to Oswego in the 1970’s..
We have the same problem here: I was recently told by someone that it made ‘no difference’ if a pedestrian is hit at 20 or 50km/h. Famously we do have som Autobahns here with no speed limit (although they aren’t as common as people think) the trouble is that firstly when there is a crash on a ‘no speed limit’ Autobahn the results are horrific, and that it tends to create a culture where drivers think they can drive as fast as they want on residential streets as well. I’ve lost count of the times I was verbally abused by drivers for going ‘too slowly’ on residential roads with a speed limit of 7km/h, and demanding that I ‘get out of the way’. the later measure is considered able to save 450 life/year according to a report. I don’t have a big problem with the idea of a review, because I think there probably are some places where the speed limits are not consistent with the road infrastructure. But the process should be transparent and engineering factors should be cited in each case where there is a change. And, in my ideal fantasy world, along with making a big noise about how limits are being raised in the places where it’s appropriate to do so, the government should take the political opportunity to announce that the speed limits on all roads would now be strictly enforced. “More B.C. drivers want return of photo radar than higher speed limits: Poll” a headline in the Richmond Review that cites an Insights West survey. This shows that I am not alone. Indeed 48% of people polled in my age cohort (55+) support bringing back photo radar. We were driving back from Harrison Hot Springs on Highway #1 through Burnaby recently. This is currently a construction zone (fines double) with an 80 km/hr limit. My partner carefully drive at the speed limit – every other vehicle passed us. If there had been photo radar a sizeable chunk of the cost of this project could have been recovered right there and then. Actually average speed cameras would have done an even better job.